Posted September 18, 2014 by laurielmorrison & filed under Author Interviews, Middle Grade Literature, Student-Author Interview Series. A new school year means…more student-author interviews! 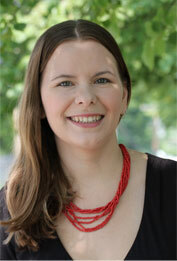 I’m thrilled to feature Caroline Carlson for our first interview of the year. Caroline is the author of The Very Nearly Honorable League of Pirates trilogy. In the first book, Magic Marks the Spot, Hilary Westfield, who has always wanted to be a pirate, is not deterred when The Very Nearly Honorable League of Pirates denies her application because she is a girl. Her impossible-to-please father sends her off to Miss Pimm’s Finishing School for Delicate Young Ladies instead, but Hilary and her talking gargoyle manage to escape. Hilary gets a job working for a freelance pirate known as the Terror of the Southlands, but on one condition: she has to find a very famous treasure or else she’ll get sent back to finishing school and she’ll never get to work as a pirate again. Hilary’s adventures continue in the brand-new second book in the series, The Terror of the Southlands, which is out now. My copy arrived yesterday, and there’s already a line of students eager to read it. Magic Marks the Spot is hilarious, clever, and satisfying, and it practically begs to be read aloud. As a result, I read it aloud to my sixth grade class last spring. 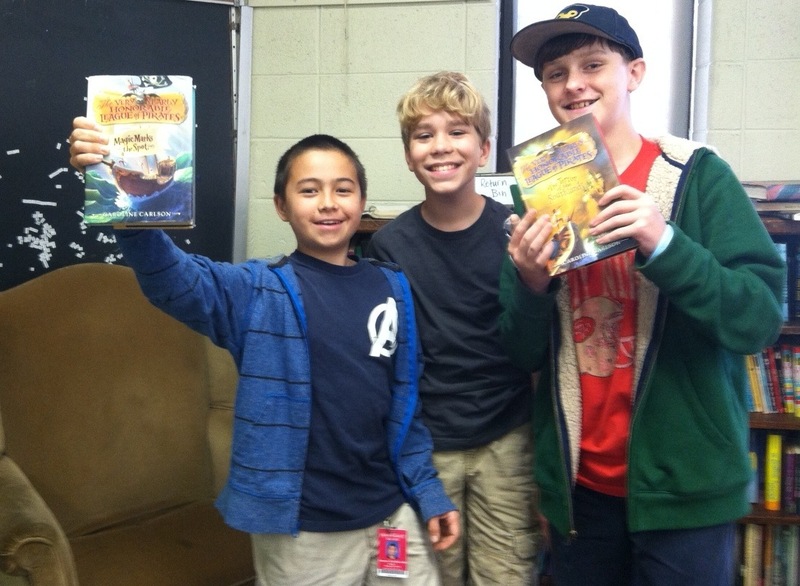 Three members of last year’s sixth grade class, current seventh graders Emmett, Max, and Silas, interviewed Caroline about Magic Marks the Spot and The Terror of the Southlands, writing, and middle school. Enjoy the interview! Silas: I like how funny it is and how it has a major plot twist at the end. Emmett: I like how it’s kind of steampunk with people traveling by trains, and even the way people think of pirates feels old-fashioned. Max: I liked the character development. I thought it was funny seeing how the characters’ personalities were developed. Silas, Emmett, and Max: The gargoyle was funny! Caroline: I’m so glad you all enjoyed the book! I agree about the gargoyle—writing his lines always made me laugh out loud. Silas: About how long did it take to write Magic Marks the Spot? How about The Terror of the Southlands? I wrote the first draft of Magic Marks the Spot in about 4 months. That’s pretty fast for me—I’m usually a fairly slow writer, but I think different books come at different speeds, and this one was a quick one! I did lots of revision, though, both by myself and with my editor at HarperCollins. The revisions took me almost a year. Then the editors, designers, and artists at the publishing company spent even more time turning the manuscript into a printed book. The total amount of time from the day I wrote the first pages of the book to the day it was published was 2 years and 9 months. The sequel took me another 4 months to write and another year to revise. I just finished revisions for the third book in the trilogy; that one took me more than 6 months to write, but only 6 months to revise. Every book is different, so I have no idea how long it will take me to write the story I want to work on next! Max: Where did you get the idea for the plot of this book? Was it prompted by anything specific or did it come to you out of the blue? Which came first: the idea of the plot or the characters? I have always been interested in pirates, and I knew for years that I wanted to write a book about a pirate treasure hunt. The rest of the story started to come together when I visited an island in the Baltic Sea (off the coast of Sweden) called Gotland. Lots of tourists visit Gotland now, but in the middle ages, it was actually a real pirate stronghold. As soon as I learned that, I decided that my pirate story had to take place at least partly on an island like Gotland. I changed a few things about it (like the pirate statues and all the magic) and turned it into Gunpowder Island. I love books with complicated, twisty, surprising plots, so my plot ideas usually come first. I didn’t know much about Hilary until I started writing about her. And I didn’t have any idea that the gargoyle would be in the book—he just showed up and refused to leave. Gargoyles are like that. Emmett: How did you come up with the idea of a magic gargoyle? The gargoyle was actually part of a story I wrote a long time ago, when I was a senior in high school. He lived over the main character’s bedroom door and liked hearing tales about piracy and true love. I was still learning how to be a writer when I wrote that story, so it wasn’t particularly good, but I always really liked the gargoyle. When I started writing Magic Marks the Spot, I realized I needed a friend for Hilary to talk to, and the gargoyle I’d created all those years ago decided that he would be the perfect character for the job. Silas: What can you tell us about the sequel to Magic Marks the Spot? It’s called The Terror of the Southlands, and it begins about a year after Magic Marks the Spot ends. Hilary has been sailing around the kingdom with Jasper, helping him distribute magical treasure—but she’s a little bit bored. To make matters worse, the president of the VNHLP tells Hilary that if she doesn’t go on a bold and daring adventure soon, he’ll kick her out of the League. When a mysterious group of villains called the Mutineers starts kidnapping important people, Hilary decides to stop them and prove to everyone that she’s a good pirate. Claire, Charlie, and the gargoyle all join her on her search for the Mutineers. There are also plenty of explosions, detectives, magical mishaps, ugly ball gowns, and new characters (both good and evil) along the way. Max: Was Magic Marks the Spot your first book that you wrote? Did you write any other books or have other writing experience? Magic Marks the Spot is the first book of mine that’s been published, but I wrote a bunch of stories before this. When I was growing up, I wrote the beginnings of five or six different books, but I always got bored and gave up after a few pages. Then, in high school and college, I took some creative writing courses and started thinking seriously about trying to be a writer. I applied to fiction workshops in college, but I kept getting rejected, so I took poetry classes instead. After college, I worked at an educational publishing company, where I wrote and edited textbooks. Finally, I went to graduate school to study writing for children, and I wrote two full novels while I was there. The second of those novels was Magic Marks the Spot. Emmett: Who is your favorite character in the series and why? I love all my characters! This question is sort of like asking your parents which of their kids is their favorite. Claire, Jasper, and the gargoyle are all particularly fun to write because they have so many funny lines. I think that if I were going to be a character in the book, I’d be Miss Greyson, because I really like rules and being proper, but I also secretly like adventure. Emmett: What was middle school like for you? I really didn’t like middle school at all. Kids in middle school can be pretty mean sometimes, and my friends from elementary school decided they didn’t want to hang out with me anymore. I wish I had been confident and brave enough to stand up to them, sort of like how Hilary stands up to Philomena in Magic Marks the Spot, but I was more like Claire: I didn’t know what to do, and I felt awful. I spent half of seventh grade and all of eighth grade without many friends. It wasn’t fun, but I learned a lot about trying to treat people nicely even if you don’t really want to, and since then I’ve tried to be kind to the people I meet because I know how hard it can be to feel alone. Things got better after a couple years—I made new friends, and people were a lot nicer once we all got to high school. Max: Did you already like writing then? I already knew I wanted to be a writer, but writing itself seemed really difficult! As I mentioned earlier, I tended to get bored with my stories after only a few pages. I worried that I would never be able to be a real writer since I couldn’t even write a whole story, let alone one that was any good. What I really loved was reading. I wanted to learn to write stories like the ones my favorite authors wrote. Silas: Did you have any idea that you would become a writer when you grew up? I hoped that I would be a writer, but I wasn’t ever entirely sure it would happen. Writers didn’t even seem like real people to me then—they seemed sort of like superheroes. I still feel that way about my favorite authors even now. When I get the chance to meet an author whose books I love, I get really nervous and I start saying ridiculous, embarrassing things. I’ll probably keep doing that for the rest of my life! Thank you so much for answering our questions, Caroline, and thanks for writing such fun and original books! Photo from carolinecarlsonbooks.com, courtesy of Amy Rose Capetta. I LOOOOOOOVE these student interviews! I’m so excited to hear about Caroline’s new book. As soon as I get my act together, I’ll contact her for an interview of my own. Until then, I’m glad your students had the opportunity to interview her. They always ask great questions. Thanks so much! I’m so glad you enjoy reading these interviews, because they’re always lots of fun to organize! I love finding out what students want to know, too. Great questions and comments by Emmett, Max, and Silas. And of course brilliant responses by Caroline. I love this series! Thanks, Sandra! I’m so glad! Thank you for another addition to this fantastic series! It’s such fun to hear an author interviewed that I know personally. The boys asked fantastic questions too!